Should You Be LOCKING Your Loans? 1. While I am confident that the Debt Ceiling Debate will be settled (whether it’s for six months or a year), my greater concern is the growing belief that the ratings agencies are looking at downgrading our government’s bonds from our AAA status. By lowering the credit rating of the bonds being presented to the market, the confidence of those who buy our bonds will be shaken. In order to overcome the risk of lower rated bonds, we will need to offer greater rates of returns on our bonds. THAT will result in a rise in mortgage rates because mortgages are what make up the bonds. This will affect virtually every conforming loan limit home buyer, whether they have conventional or government (FHA/VA) financing. 2. The pending lowering of the maximum loan amounts (slated for October 1st) that can be sold to FannieMae, FreddieMac and GinnieMae (in high cost areas from $729,250 to $625,500 for single family homes) will create more “Jumbo Loans”. Jumbo loans have historically been .25% to .375% higher than conforming loans; however, industry insiders are hinting at a much bigger spread (.75% or more). Granted, this will not impact most home buyers, but it is worth noting. Now, it is possible that neither item becomes effective. Let’s keep our fingers crossed. Yet, what is the benefit of NOT locking. Maybe rates could go down an eighth or a quarter of a percent. Is that worth the risk of a rate increase that would be quick and dramatick of a half of a percent or more? The safe bet is to LOCK to protect yourself……my mother always said, “better safe than sorry”. I do so love the Blues! The 2011 Free Concerts in the Park series is made possible in part by funds from the New Jersey State Council on the Arts/Department of State, a Partner Agency of the National Endowment for the Arts. The artists from the 2010 South Orange International Blues Festival (SOIBF) return to Flood's Hill highlighting some of the great performances from last years' inaugural festival. Featuring the Michael Hill Blues Mob, bassist Mike Griot, and guest performers Carl Burnett, Al Gold, John Fritz and Shari Pine, the SOIBF Revue promises to be a mid-summer evening of soulful grooves and modern blues. As part of the Rock the House series, Rock the Hill has been delighting audiences for three years with its eclectic mix of local and visiting garage bands. Known for putting on honest-to-goodness rock shows, Rock the House takes Flood’s Hill to close out the 2011 Concerts in the Park series. To forward this e-mail to a friend or colleague, use this link. To change your e-mail address or update preferences, use this link. if you missed the last music event at Revolution come out this Thursday night at 7:00 for the Jimmy Lee Ramblers. They were well received at Maplewoodstock and are eager to play here again. We have received many requests from our guests for more evenings of music, food and good times, so...let's do it again. Having loved the books, I Robot, by Isaac Asimov and enjoying the movie of the same title, starring Will Smith, there is no doubt that our love affair with Robots and such has provided much fodder for movie after move and book after book. However, if you had the inclination to "build" one yourself, you were pretty much left to find a financial backer or be old enough to go to Columbia High School in Maplewood/South Orange, winners of this year's State Competition--http://www.somsd.k12.nj.us/chs/cwp/view.asp?A=3&Q=295305. This looks to be a great alternative to the many bowling, cooking and gymnasium parties i have attended or hosted with my 9 year old son-Jake. A robot must obey any orders given to it by human beings, except where such orders would conflict with the First Law. 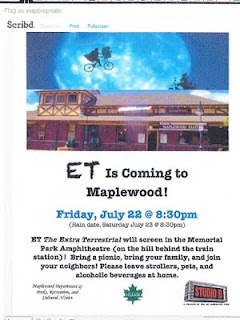 No, ET wasn't filmed in Maplewood, nor is there now a Super Skate Park/Half Pike for kids to jump over the train station. What it is, is a series of out door movies being shown in the Maplewood Park system. Last night, the Hilton Neighborhood Association sponsored a free Movie-in-the-Park at DeHart Park, 120 Burnett Avenue, Maplewood. The feature silent film featured was, Steamboat Bill, Jr., starring Buster Keaton, and it was accompanied by live piano. 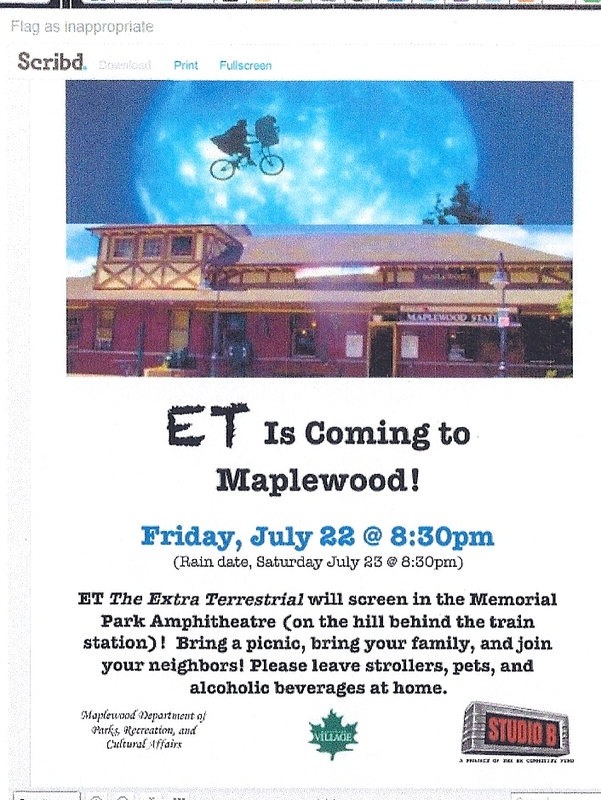 Tonight, the Maplewood Recreation Department is showing E.T. The Extra Terrestrial in Memorial Park. Police warn residents to keep small pets and garbage indoors after a black bear sighting Tuesday. North Caldwell resident Dana Strus took a video of a black bear taking a dip in her pool Tuesday before calling police. The North Caldwell woman who videoed a black bear in her pool Tuesday is pregnant with her second child and due to give birth this Saturday. Dana Strus told Patch she did a doubletake when she looked out her window Tuesday and saw a bear in her yard splashing itself in her pool. She said she had just gotten back to her house on Willowbrook Drive with her three-year-old daughter around 2 p.m. when she spotted the cub. Strus said it was most likely because of her pregnancy that she remained so calm. “Nobody’s going to believe me,” thought Strus. So she grabbed her camera and went outside on her patio to take pictures and a few short videos. She said she was aware of the bear for about five minutes before she decided to call police. But before police arrived, the black bear, estimated to weigh about 100 lbs., had hopped back over the fence into a neighbor’s yard and made its way back onto the road. Police lost track of it as it headed down Willowbrook.